...and it was all very nicely spun and obscured by the virtually useless "mainstream media" (the "McMedia"--wholly corporate-owned and elite-controlled). If you've previously read through Chapter Seventeen in my book, you know there is a lot of insider testimony regarding extensive encounters with "ETs" and UFOs" during space travel and in exploring and landing on the Moon. Colonel Phil Corso, a former top aide to General MacArthur during WW2 and who later became the Pentagon's 'point man' for all things UFO and/or ET, has described how NASA was forced to abandon their plans for further Moon exploration and the establishment of a Moon base...due to incessant harrassment from mysterious non-humans (ETs). Many others have testified similarly--reports of astronauts being interdicted while orbiting the Moon...the UFO crafts coming so close that "beings" could be seen peering out of windows. On and on these testimonies go. You'll have to read through my Chapter Seventeen...and click on a lot of the links which lead down very interesting paths of further research. There has been, for example, the Disclosure Project, in which nearly five hundred government whistleblowers (generals, admirals, technologists, aviation officials, top intelligence directors, and so on) testify to a gigantic ET/UFO cover-up on the part of the US government. I provide links to their website, as well as their "coming out" press conference at the Washington Press Club in 2000. Dr. Steven Greer who heads up this group, selected 10 or 12 representative witnesses to give brief summaries of their experiences. The various high-ranking military officers, aviation officials and intelligence officers have amazing testimonies to share. 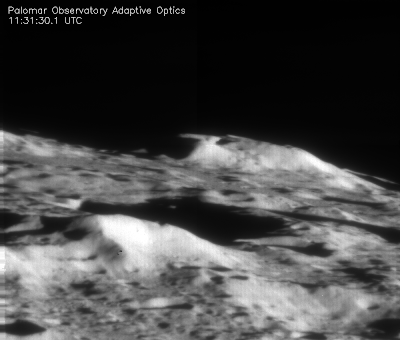 I would imagine the entire Disclosure Project community and many other NASA observers must have been enjoying a very satisfactory "I-told-you-so" moment a few weeks ago, in the aftermath of NASA's attempted spacecraft crash-landing on the Moon. It didn't go so well, as we will see. I wish I had put this in writing somewhere but...I had previously told a number of my friends that I saw a strong possibility this intentional crash might not go as planned. I based this guess on the reports from many whistleblowers...that ETs (in biblical terms--"fallen angelic beings") apparently have a very proprietary stance regarding the Moon. Who knew? As I said earlier, a number of whistleblowers, including Colonel Corso, have claimed that NASA had to abort any further manned Moon missions because of extensive non-human interference. Dozens of insiders have reported some kind of non-human colonization of the Moon. And when you think about it, it is quite anomalous...very strange that not one single Space Shuttle crew in all these years has packed a few extra lunches, changes of underwear, etc...and executed a simple slingshot maneuver and headed off for a few laps around the ol' Moon. Hmmm--why is that, I wonder? Equally anomalous is the fact that a number of countries (including the US, China, Japan, and India) have had unmanned spacecraft orbiting and mapping the Moon...yet to this day, though I can literally identify the barbecue pit in my own backyard from outer space using Google Satellite or Google Earth images...we're being denied this kind of photo resolution for any of these recent Moon photos. Why is there no "Google Moon" available, with comparable resolutions? No good answer is forthcoming. Anyway...this crash-landing had been hugely hyped by NASA and the media. They even had a "kid's space camp" overnighter outing on the front lawn of the White House. The president himself came out to visit...gamely peering through a few of the telescopes, shaking hands with the children. This was a big deal: The explosion was supposed to be so huge (the equivalent of one ton of TNT) that we were going to be able to see the explosion plume from earth through very modest telescopes or even binoculars. The spacecraft was going to impact the surface at over 7000 miles per hour. But...sure enough (and you can watch it as it happened live on Youtube copies of the NASA broadcast) the "crash" didn't materialize. Did...not...materialize. Period. You could hear the NASA spokesman as he ratcheted up the intensity: "Ready for Centaur impact....!" And then....nothing. Nothing happened. No plume of dust. No flash. No nothing. For all intents and purposes, the craft disappeared. Swallowed up into this alleged "crater" which NASA had selected as their target. Astounding stuff. You could hear the dumbfoundedness in the voices of the various technicians. VIDEO--(Impact occurs at about the 3:43 mark). Several minutes later, one of the techicians finally spluttered something about having at least some kind of reading of a "heat signature". Many minutes later?! What was it?--Maybe (as Dave McGowan suggested) it was the giant alien spacecraft-eating machine emitting a belch? Who knows. Not a single indication that an object weighing several tons had crashed and unleashed the equivalent of 2000 pounds of TNT explosives. Go to this page at the Mt.Palomar website and scroll to the bottom. 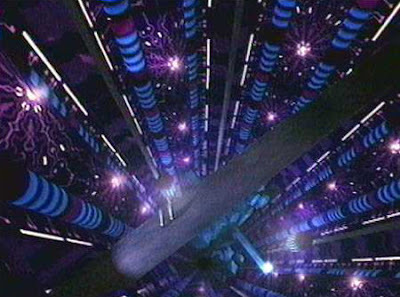 There you can click on an "MPEG" movie of the impact sequence as seen through Mt.Palomar's gigantic telescope. NASA and the McMedia began a furious "spinning" campaign and have made the whole story go away. The media spun it as "oh well, it was kind of boring...not much to see". ...but rather it was because NASA's "black ops" department had a particular interest in suspicious anomalies associated with this "crater" (Cabeus crater). It was said to be so deep, no sun rays were reaching the bottom...thus there was supposedly the potential for ice. I don't know about any "black ops" theories. I do know there have been many reports of Moon-based "ETs" who apparently dislike human presence. I will admit that some of the photos which Hoagland has dug up from this crash mission are a bit intriguing. Hoagland claims to identify massive geometric shapes in these photos and envisions what may possibly lie beneath the moon's surface, in the depiction below--a vast underground facility. I do see seemingly 'geometric" shapes peering out from under the Moon's surface in this very strangely manipulated official NASA photo (above). But...I don't know. 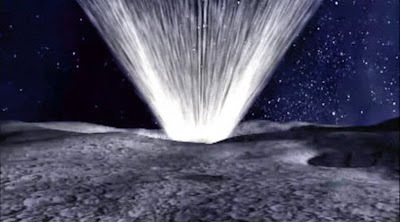 1) A space craft disappeared upon impact with the Moon's surface. 2) There was widespread befuddlement in the scientific community...and at any number of science discussion boards where very knowledgeable people sought to unravel the mystery. 3) The media spun and then buried the story. 4) This is in a context of withheld satellite photos of the surface of the Moon which have comparable resolutions to those available for Earth images. 5) Also in a context of massive testimonies regarding all kinds of ET and UFO shenanigans on the Moon...and in the context of many whistleblower testimonies regarding literal 'colonization' of the Moon...reports of "structures" on the Moon. As Bible believers, we know the bad guys have beset and besieged Planet Earth. But until recent years of researching the evidence on the Internet (the Disclosure Project, etc) I had never thought in terms of this satanic quest being so 'down to earth' (so to speak), physical, painstaking. A brick-by-brick, step-by-step process, apparently. I always vaguely assumed that when it was the Devil's time for his short heyday, he would just wave a magic wand or something. Simply stride into the halls of power and commence his Antichrist world government. But apparently he has been feverishly, maniacally, methodically working his fingers to the bone to achieve his goals. The Devil is nothing if not desperate.